No woman is immune to occasional low moods. They come with the changing seasons, they are caused by hormonal fluctuations and bad eating habits, and they are triggered by sad life events, such as divorce or loss of a family member. Sometimes, however, mood drops last much longer, start interfering with women's life, and might signal more serious conditions. A prompt recognition of low moods can lessen their impact on your life. Continue reading to learn how you can recognize a mood drop and manage it more effectively. Mood drops are characterized by sadness, hopelessness, and feeling unmotivated, unable, and miserable. They can be caused by hormonal imbalance, which is very common in women throughout menopause. Persistent and prolonged low moods can indicate depression, which is twice as likely to happen in women as men. Certain medical conditions, such as thyroid dysfunction, sleep disorders, or certain central nervous system diseases, can trigger low moods as well. How to Recognize Low Mood in Yourself? Generally, it is difficult for women to realize that they are suffering from a mood drop that requires a medical attention. They might notice that they are less cheerful and optimistic or more frequently under the weather, but they often ignore it and put the blame on stress, work, and other common triggers. How to Recognize Low Mood in Others? It is often easier for the family and friends to spot the first signs of persistent low mood. Looking from a distance and with more objectivity, they often notice that that their loved one is unwell much faster. The signs of a persistent low mood vary, but generally, women appear sad, absent-minded, or disturbed. They tend to isolate themselves from friends and family and limit their social activities. Often, they neglect their hygiene and do not leave the house for a number of days. Women might also visibly gain or lose weight. Some of them increase alcohol consumption or use illegal drugs. In severe cases of low mood, women talk about death and dying. Light sessions or regular walks out in the bright light can effectively reduce the heaviness of your low moods. Alternative therapies such as meditation, aromatherapy, or acupuncture, have also been shown to improve mood. Herbal supplements, like phytoestrogenic or hormone-regulating supplements, can bring you relief from low moods as well. 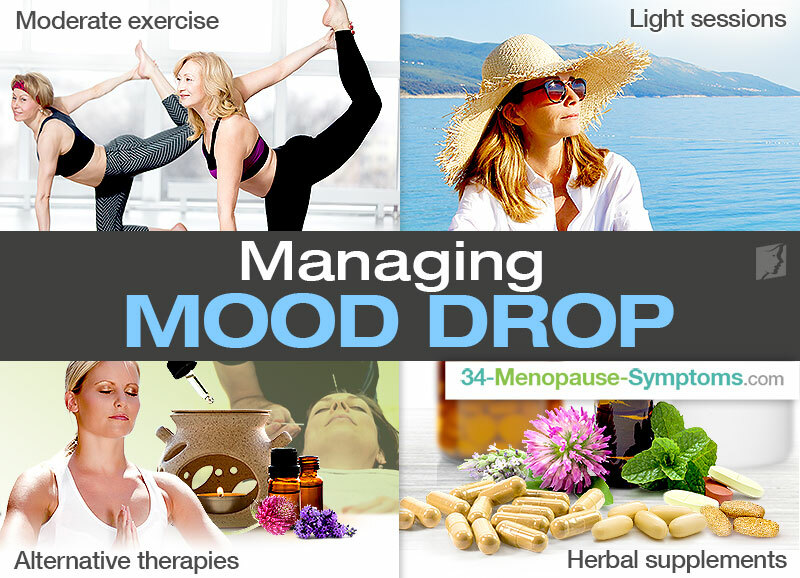 Mood drops that are a part depression require a proper evaluation and can be effectively treated with psychotherapy, medications, and the above-mentioned supportive treatments. Low moods caused by other medical conditions can also be managed with medications, such as thyroid hormones. Don't forget to check out some natural ways to control mood swings with vitamins and herbal remedies.